Different types of full dentures are available for replacing missing teeth and restoring your smile. Full dentures are sometimes also referred to as complete dentures and can be used to replace a full arch of missing teeth. A dentist can recommend the type of full dentures most suitable for you. At Jackson County Dental, Dr. Matthew Pierce and Dr. Lane Severe are your Seymour dentists for full dentures. Replacing missing teeth with dentures has several benefits. Not only can dentures help restore your smile, they also help restore normal biting and chewing functions. Additionally, dentures provide support for sagging facial muscles so the natural shape of the face is restored. Dentures can also improve speech by correcting placement of the tongue when speaking. If you are missing a full row or arch of teeth, full dentures can be used to replace those teeth all at once. There are three main types of full dentures: immediate, conventional, and implant-supported overdentures. Depending on your situation and needs, you might temporarily start with one type of full denture and switch to another type later. Dr. Lane or Dr. Severe, your Seymour dentists, can discuss the different types of full dentures with you and fit you for the right type. Immediate Full Dentures: This type of denture is typically only worn temporary until it is time to switch to conventional full dentures. Immediate full dentures are often used following extraction of teeth. The gums need time to heal following extraction so it is not possible to get a good fit with conventional full dentures right away. Immediate full dentures make it possible to restore your smile while the gums heal and you wait to be fitted for conventional full dentures. Conventional Full Dentures: This type of denture is meant to be worn permanently. Conventional full dentures are custom made for each patient and conform to your mouth over time for a perfect fit. Once in place, conventional full dentures look like your natural teeth and can perform normal biting and chewing functions with ease. 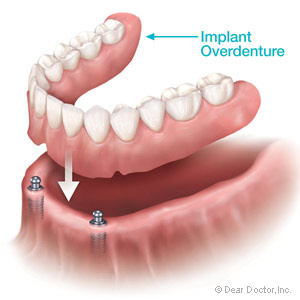 Implant-Supported Overdentures: This type of denture is also meant to be worn long-term like conventional full dentures. Several dental implants, which are placed directly in the jawbone, are used to hold the dentures securely in place. The dental implants provide an additional level of stability and support for the dentures. The different types of full dentures can help you restore your smile, as well as provide support for sagging facial muscles, restore speech, and make it possible for normal biting and chewing functions to resume. To find out which type of full dentures is right for you, schedule an appointment with Dr. Pierce or Dr. Severe, your Seymour, IN, dentists, by calling Jackson County Dental at (812) 522-8608. If you are missing any teeth, dentures can give you a complete smile and so much more. In addition to replacing missing teeth, dentures also restore normal tooth functioning, improve speech and restore a more youthful appearance by providing support to sagging facial muscles. Whether you are missing all of your natural teeth or just a few, there are different types of dentures that can help. At Jackson County Dental, your place for dentures in Seymour, IN, Dr. Matthew Pierce and Dr. Lane Severe can determine which type of dentures are right for you. There are many types of dentures, including partial and full dentures. Partial dentures are used when you still have some natural teeth along the top or bottom arch, or both. The dentures fit around the natural teeth so your smile will be a mix of natural and artificial teeth. Types of partial dentures include removable and transitional. Full dentures are used when no natural teeth remain. The denture contains a full set of teeth for the top or bottom arch. Types of full dentures include conventional, immediate and implant supported overdentures. Replace missing teeth and restore your smile. Improve self-confidence by regaining a full smile. Restore normal tooth functioning, such as biting and chewing. Improve speech by correcting tongue placement when speaking. The benefits of getting dentures are numerous. Not only can dentures replace missing teeth and give you a full smile, but they can also improve speech and restore normal tooth functioning. For dentures in Seymour, IN, schedule an appointment with Dr. Pierce or Dr. Severe by calling Jackson County Dental at (812) 522-8608. What you need to know about getting dentures in Seymour. You want to replace your missing teeth but you’re not entirely sure what the best option is. When it comes to getting tooth replacements our Seymour, IN dentists, Dr. Matthew Pierce and Dr. Lane Severe, offer different options to cater to your different needs. If you are contemplating whether dentures are right for you, discover some of the benefits to getting this oral prosthetic. Dentures have been a tried-and-true way to replace missing teeth for many years and have been able to give people back their full smiles. It can truly be a lifesaver for those with severe tooth loss but as dental technology becomes better and better there are more reliable and long-term solutions that patients often turn to instead. Dentures are still popular because they are a simple and fast treatment and they are inexpensive. The price point can be a major factor for patients when it comes to replacing missing teeth. However, our Seymour general dentists can talk to you about payment options to help you get the smile you want at a price you can afford. A major drawback to dentures is that they often stay in place with denture adhesive or through suction, but dentures don’t often stay in place like they should. Those who wear dentures may find challenges securing them in place. Dentures may shift around while eating or while speaking and sometimes lower dentures can cause sores or gum irritation, particularly when they move and shift around. You’ll also have to follow a rather strict cleaning and maintenance routine to make sure that your dentures last. Dentures aren’t designed to last more than a few years. The average lifespan of dentures is around seven to 10 years. Of course, just because you decide to get denture doesn’t meant that you’ll just have to put up with a less-than-perfect smile. Talk to us about whether you are a candidate for dental implant-supported dentures. Implants are small metal posts that act as tooth roots and are surgically placed into the jawbone. Several can be placed along the bone to support your dentures. And since dental implants are designed to last a lifetime you won’t have to worry about replacing them every few years. Do you have questions about dentures? Do you want to know if dentures are the right restoration for you? If so, then call Jackson County Dental in Seymour, IN today to schedule your no-risk consultation. You deserve to have a beautiful smile!